In the 1970s, 3,000 people from Mola di Bari, a small fishing village on the Adriatic Sea, travelled by ships to New York, making their way to find friends and family settled in Carroll Gardens, Brooklyn. Back then, more people from Mola di Bari lived in Carroll Gardens and Red Hook than in their Italian hometown. Since then, the Molesi, as they are known, slowly moved out of the neighborhood, heading to Staten Island and Bensonhurst, New Jersey and elsewhere. There’s only a few hundred left in Carroll Gardens. When South Brooklyn Post published a story in December about a “war” between rival Brooklyn Italian-American clubs, mediated by the Catholic Bishop of Brooklyn, who assigned Scotto Funeral Home Director John Heyer as “peacemaker,” it caused quite a fuss. People in Italy read the story, as did people here. Much agitation ensued. At the heart of the conflict is a charismatic former fashion designer and a battle of the sexes, sort of. The story gets a little more complicated, and then a little less, but in the end, it’s a Brooklyn tale about the struggles of old and new, tradition and change, and the fight to keep Catholicism alive in today’s New York City, among Italian-American immigrants from a tiny fishing village. Italian village with whitewashed homes on hills and a beach considered by some among the best in Europe. The Molesi, from Bari (the region), have a history dating to the 1930s as dock workers in Red Hook whose kids opened shops in Carroll Gardens, from The House of Pizza and Calzone on Union Street to Caputo’s gourmet food shop on Court. The largest group of Molesi came here in the 1960s. Mola di Bari was a sleepy town after World War II, without much in the way of jobs, according to immigrants who moved here. Arriving in Carroll Gardens, the Molesi joined their Italian brethren here who hailed from Southern Italy and Sicily. Carroll Gardens was a veritable Little Italy. People spoke Italian and Court Street was lined with butcher shops. Residents worshipped at Sacred Hearts-St. Stephens Catholic Church, at Summit and Hicks streets, the oldest Italian parish in Brooklyn, established in 1882. Coming over on boats, the Molesi brought with them a sacred tradition: Each year, on the second Sunday in September, the people of Mola di Bari celebrate the feast of the town patron saint, the Maria SS Addolorata, or Mary, Our Lady of Sorrows. Men carry the Mary on their shoulders through the town of Mola, and through the streets of Carroll Gardens. It is the only such event in the United States. The Feast of Our Lady of Sorrows procession — a big cultural event for local Italian-Americans — was launched in Carroll Gardens in 1948. But not after much sacrifice. The immigrants to Carroll Gardens were poor. They were laborers, often uneducated. They pooled their money for years to commission a replica of the Maria SS Addolorata, and to bring her to Carroll Gardens. They formed an organization, the “Congrega,” which manages the annual procession. The group is the glue that holds the Molesi in Brooklyn together, led by respected men in the community. Until recently. A couple of years ago, about 100 women and their husbands, led by Lucrezia Nardulli, a mother and former fashion designer, split away from the Congrega, and formed their own group. This splinter group found a new home church in Bensonhurst, with their own procession, and their own replica of the Maria SS Addolorata. The women’s move caused great dissension. There were loud verbal battles, and much anger. Some Molesi men in Carroll Gardens told me it was a war. Nardulli travelled to Italy with her family last year, where she says her son was verbally attacked about the conflict. The Maria SS Idolorata is a dramatic figure. Her face is full of pain. Her procession, held on the second Sunday in September, is a serious affair, a funeral march. Preparations are intense. It’s been that way for hundreds of years. The SS Idolorata is a Mary in mourning, with a sword piercing her heart; literally, a gold sword protrudes from her chest. She is dressed in an ornate black-and-gold Medieval dress, with a crown on her head. You can see a version of her standing watch over the garden at the Van Westerhout Cittadini Molesi Social Club on Court and 4th Place. She represents the pain a parent feels to lose a child. Mary is mourning the death of Jesus. 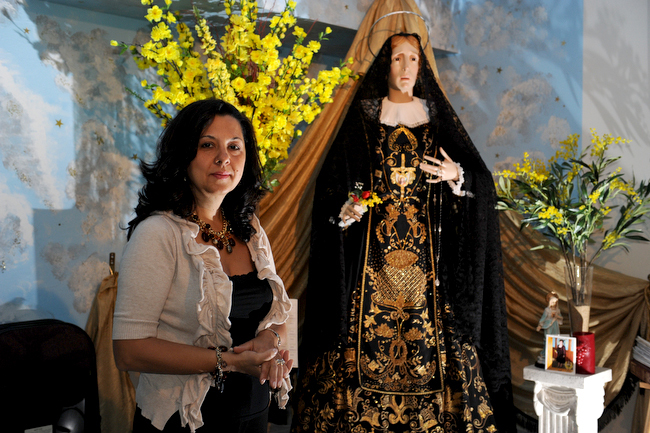 The Carroll Gardens Maria SS Addolorata, carried in the processions, is an exact replica of the statue in the town square in Mola, and she is stored at Sacred Hearts-St. Stephens Catholic Church. Her procession mirrors religious processions held across Italy. Paying homage to the Maria is the major twice-annual event in the Brooklyn Italian-American community (a smaller procession takes place on Good Friday). Italian-Americans drive in to Carroll Gardens from all over, to visit old friends and family. The march weaves around Carroll Gardens for three hours, following the same route since 1948. A funeral band plays. Traditional hymns and prayers are sung in Italian. Feasts are held. It is a great honor for the men chosen to carry the statue. It’s very heavy. In Mola, men pay for the honor; here, they do not. In days past, people watching the procession would give gold coins to the men carrying the statue, and the men would attach the coins to their clothes. Care is taken to carry the Maria out of the church while she is facing into the church, with her back toward the street. There is a fear that if she turns her back to the church, she may not return. Around 2007, a bubbling conflict poured over at the Congrega. Every year, the Congrega elects a female president and a male president. Nardulli was the female president. John Ingravallo is the male president. As co-president, Nardulli says she was unhappy with the status quo and role of women in the group. She began to press for more rights, and equal rights, for women. Nardulli and others wanted to modernize the Congrega, to hold more events for children and teenagers, to have dances and Italian cultural events. Nardulli did not agree with the division of duties between the men and the women. There was friction. Two groups emerged: An old guard in favor of doing things in the traditional manner, and a new guard, in favor of change. The two sides could not come to agreement. The splinter group was thrown out, and banned from the Carroll Gardens procession. 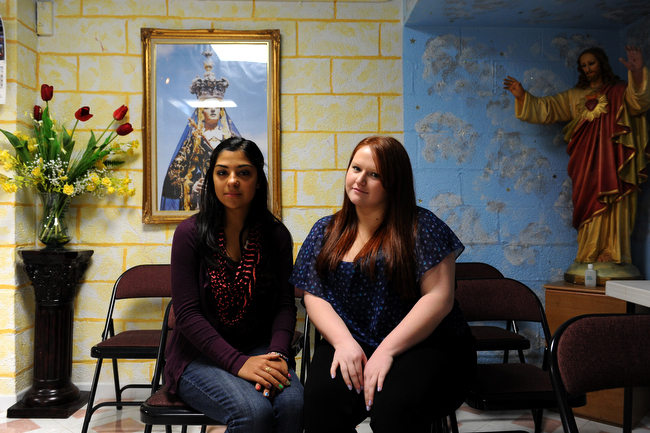 The women formed the Associazione Culturale Pugliese Figli Maria S.S. Addolorata, in Bensonhurst, where many Molesi now live. After missing two Carroll Gardens processions, Nardulli’s organization spent $20,000 to have another replica of the Maria – wooden, and handmade in northern Italy – produced and shipped here. They launched their own procession. This caused outrage. Screaming fights took place over dinner tables. Families and friends were split. Bad blood intensified. The Bishop stepped in, designating John Heyer as peacemaker, in October 2010. Today, there are three processions, one in Carroll Gardens, one in Bensonhurst, one in Mola. I travel on the F train from Carroll Gardens to Bensonhurst to visit with Nardulli at the church where her splinter group has made its home, St. Athanasius, on Bay Parkway. The split cut the original group in half, from about 200 people to 100. Nardulli’s group now has about 200 members. I walk past a huge cemetery before reaching the church. It’s getting dark, it’s cold, and the church is empty. I walk around. There is a nunnery on the side of the church. I’m not sure exactly where I am or if anyone is around. It’s a little creepy. Finally I notice a black metal fence, and stairs leading down to a door. I knock on the door. Through a window I can see a bright light reflecting sunshine yellow paint in the hallways. An attractive woman with thick, black hair walks toward me. She’s dressed smartly, in brown fitted slacks and high heels that might be Prada. It is Lucrezia Nardulli, and she kind of sparkles with glamour when she opens the door. It puts me at ease. 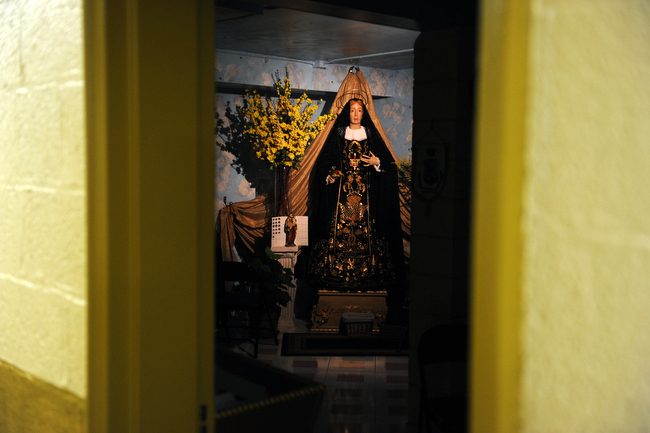 Nardulli shows me into a side room, and there she is, the Madonna, Our Lady of Sorrows, looking very sorrowful indeed. The room is heavily adorned with decoration and flowers, painted in yellow and blue. JoAnn Marinelli, Nardulli’s vice president, introduces herself to me. “Are you Catholic, Lisa?” she asks right off. I tell her my parents are quite Catholic, I grew up with the church. “Ah, then you understand,” she says. “The church, it’s not packed. We had to do something to bring in the children. Her husband carried the Maria in the procession for 42 years. “42 years!” she says, her eyes widening with emotion. “We don’t war,” Nardulli tells me. “We don’t like it. I come from Italy. In Mola, my grandmother was in charge of the Madonna. She cleaned her dress. I always looked up to her. When I moved here, I wanted to be a part of the community. I wanted to be a part of that. “They needed a woman president. The men, they like to have more power. They are working men; good people. I have nothing against them. They are devoted to the Madonna. “We are a different generation. We are supposed to have equal rights. Us women, we work. We want to be respected. There was not that respect. We were separate. They threw us out,” Nardulli says. Nardulli works for the Department of Education, and had her own clothing store in Bensonhurst, until she gave birth to her first son, Joseph. Her career ended at that moment, she said. Joseph is 21, and her twins, a boy and a girl, 17. She lost a girl in vitro, when she was seven months pregnant. “That gives me pain, throughout my life,” Nardulli says, and a special connection to the Maria SS Addolorata. Marinelli and Nardulli talk to each other in Italian, and take me into a room with a large conference table, where they have coffee and tea and an Italian cake set up. I say that I do not want any cake, thank you, but would love some coffee. They put out the cake, “Maybe you will change your mind,” Nardulli says. She’s right. Before long I taste the cake, which, like nearly everything Italians eat, is sinfully delicious. It’s got an unusual flavor, fluffy, and sweetened with rum-soaked dried fruit. Marinelli says she was devastated to be ousted from the annual procession. She had attended every year since she was a child, and met her husband there. Nardulli, too, met her husband at the procession, shortly after she came to the United States in 1977 from Mola, when she was 16. “That’s how everyone met their husbands,” said Marinelli. Their fathers were founding members. But much has changed from the 1970s, Nardulli says. “Women here are stronger,” Nardulli says. “This is a new generation. Women work. Some people, they think women are good for only one thing. We get coffee, and tea, and clean up. “Don’t get me wrong. We mop the floors, we keep our position, we cook. We take care of the children. We do all of that. But we work, too, and we want respect. “Are you a feminist, Lisa?” Marinelli asks me. I’m not sure how to respond at first, the question catches me off guard. The battle with the Congrega has been painful, Nardulli says, but she was not going to live without the Maria, and the procession. I get a call at night. Joanne is worried that this story will enflame tensions. But she’s also very upset about the split, which has fractured the local Italian-American community. “Our relatives brought this tradition from Italy. We carry it on,” Marinelli says. “We should agree to live in peace. “We don’t want a fight. What can you do? We are educated. You educate people, and what happens? This is 2011. We’re more modern now. We want the respect. We don’t take respect away from our men. My husband, he’s my king. He gives me everything. He came in 1966, after my father. “But, education happens. It’s like you are in a cocoon, and you come out. We’re not that bad as they think. Already, our religion is down, and we’re trying to bring something in. The churches are not packed. We’re trying to promote our religion, our culture, to our kids. We have Italian cultural events, dances. “It’s like England. America split from England. And they’re still unhappy about it, aren’t they? It’s rainy and cold in early March when I head down to Gargiulo’s Restaurant in Coney Island, for the International Day of the Woman celebration. Nardulli has hosted the event every year, for years, in memory of the women who perished in the fires at the shirtwaist factories in Manhattan, 100 years ago this past March. The New York Times ran a month’s worth of coverage of the fires, which were historic and tragic, as young people, mostly Jewish women, perished because workroom doors were locked. More than 100 charred bodies lined the streets the next morning. The tragedy sparked a change in safety laws for factories. “Lucrezia enlightens us to a lot of things we weren’t even aware of,” Marinelli tells me. It’s festive in the party room for the women’s day event. Flowers are on the tables, music thumps, there’s a disco ball and open bar. It’s all women, dressed in Sunday best. As they are Italian, there is lots of glamour — perfume, makeup, hairspray, high heels, short skirts, tans and cleavage. The only men in the room are the bartenders and the DJ. I talk to JoAnn Perrone, the secretary of Nardulli’s organization. “I think it’s a very terrible thing,” this battle, she says. Perrone says that as a child, she dressed as the Madonna every year to attend the Carroll Gardens procession. Her uncle and grandfather were founding members, but the Congrega was an insular group. “My mother didn’t have the opportunity to join. You had to know someone,” Perrone said. This new organization, “gave us an opportunity to participate,” she says. I talk to John Ingravallo, president of the Congrega, on the phone. Ingravallo, 70, is a licensed electrical contractor. He came to Carroll Gardens from Mola when he was 16. He came with his mother, his father having died, and his uncle shepherded him through his transition. Ingravallo was here when the Madonna was brought from Italy in 1948 for the first procession. I ask him about some of the women’s desire for modernization, or change. “What is there to change?” Ingravallo says. “September is the Feast of Addolorata. They do it in Mola, and we’re going to do it here. It is a very successful event. At the International Day of the Woman celebration in Coney Island, Nardulli sits me next to her at the main table. I ask how many men are in the group. The women at the table, in turn, say that Nardulli has “enlightened,” them to many things. They treat her with an aura of awe and respect. Pauline Brunetti, 53, of Staten Island, is sitting across from me. All the women are a bit uncomfortable talking to me—everyone here speaks Italian, and knows each other well—but they are more than gracious and polite. Brunetti says she thinks it’s “so sad” what’s going on. “I don’t think there’s no harm done,” Brunetti says. “We decided when we joined that this was a good, modern organization to bring our culture and religion to the future. “Nobody here is at war,” she says. “The Madonna is our model,” she says. “Women open many doors, with their smiles, with their tears, with their understanding,” she says. Nardulli says a few words in Italian in a low voice; the group is hushed. She ends with a prayer. The woman sitting next to me, Gabriella, translates, saying that Nardulli has asked the group to remember all the women who are not treated well. God is with them, and we pray for them, Gabriella says Nardulli said. It’s really the use of the word, “war,” that has the women upset, they tell me. It’s a word that Molesi in Carroll Gardens had used to describe the standoff. Perhaps now, all parties are ready to move on, separately, peacefully. I talk to Maria Martino, the daughter of Giovanna Martino. Giovanna is the owner of Frank’s Deli, at Smith Street and 2nd Place, open since 1965. The mother and dedicated businesswoman is one of the old-timers torn by the feud. She attends both processions. Maria says that at first, people were asked to choose sides. Maria suggests that a question lingering in the air might have to do with the next generation of leadership. “There is concern, who will lead this into the future?” Maria says. “It’s a sore point,” says John Heyer, Funeral Director at Scotto’s Funeral Home. Heyer is a Carroll Gardens Italian-American historian. Most of the history of Carroll Gardens, I get from Heyer. He also helps organize the annual procession, and is very involved in the church. “The procession seems Fellini-esque. But they have true devotion to the Madonna. “I’m hopeful we can come to an agreement soon,” Heyer says. Sitting around the table, they apologize for the plastic cutlery and paper plate. They ask if I want wine. “No, it’s OK,” I say. They pour me a big glass. They insist I eat the veal chop with my hands. “It’s better,” they say. We finish the meal with a 10-year-old Remy Martin. My cheeks get flushed. Ingravallo doesn’t want to talk much about the split. Nardulli turns 50 this year. “It’s an honor to be a woman,” Nardulli says. “Especially if you are a good woman. I am a typical Italian woman. I go to work, I come home, and cook and clean. And then, after that, I have time for other things. We don’t have one or two jobs. Are you kidding me? At home, we clean the floor. If the floor is dirty, give me the broom. I’ll clean it. The Molesi are spread out now, flung across the New York City region, yet their heart is with the Maria SS Addolorata. December’s story on the war of the Italian-American social clubs, and a historic street naming on Court Street and Fourth Place. My parents and I immigrated from Mola in 1960 and settled in Carroll Gardens which back then was called only Red Hook. As a kid I attended Sacred Hearts grammar school which together with St. Stephen’s High School were part of Sacred Hearts – St. Stephen Catholic Church. Unfortunately, these schools are no longer in existence. Through my family I was brought up in the spirit of the Catholic Faith and a great devotion to the Maria SS Addolorata which I hold dearly until this day. I recently stumbled across your article and I must say that it somewhat depicts the old time and quite interestingly the present day mentality of the Molesi. What an unfortunate waste of energy and money which could be directed towards a charitable program(s). Can someone explain to me what has been and is the purpose of the “Congrega”?, especially the one in “Carroll Gardens”, besides managing the annual procession(s) and the “get togethers”, with spreads of food, where the men and women engage in chatting about the latest about a particular person and or family. I spoke to Nardulli while she was still part of the original Congrega, and things were heating up. I asked what it was that she wanted. She said “50/50”. I aked her what that meant, exactly what did she want that she was not getting? She went on to say that she had no access to the clubs check book and bank account. I asked why that was inportant, and reminded her that Mr. Ingravallo was the President of the Congrega, and that she was the President of the “Sorellis”, or sisters. I compared her to my fraternity, and the “Little Sisters” we had as part of the Frat. She again muttered “50/50” and again complained about not having access to the purse strings. She never explained why this was important, which immediately raised my suspicions. After all, Ingravallo cut her a check to cover all expenses, never refusing. I’m not saying that Nardulli was up to no good, but I thought it odd that she was determined to get access to the clubs funds. After that, Nardulli’s depature was her choice. She tried taking people with her. Some stayed with her, others returned back to the Congrega. There was nothing stopping Nardulli from running for President of the Congrega. She choose to run as President of the “Sorelli’s”, or Sisters. Her practices are not always ethical (she is not always truthful), and damaging to what has been a long standing tradition. The Congrega goes on without her, and they are better off. Nardulli should just fade away and let the Congrega go on with their business. Referring to the article written by Lisa, I must say that Mrs. Marinelli was right. It did create more controversy. When she cannot fall asleep at night, she should count sheep and think about what she did. They seem to be very happy by splitting the Molese community. Note from the writer: I want to say to the people of Mola di Bari, and the Molesi in Brooklyn, that I meant absolutely no harm with this article. I have great respect for the wonderful people on both sides of this conflict that I met while researching this story. I admire each of the Molesi that I met here in Brooklyn. They are warm and caring, devoted to family, hard work, and the Madonna. They are proud of their homeland and of the work they have done to give their children a good life. They greeted me, a stranger, with warmth, respect and trust, and I hope I have honored that by telling their story as clearly as possible. The Molesi care deeply about the Madonna, their homeland, and their families, and their passion is part of the fabric of Brooklyn culture. The Molesi in America include scores of college graduates, business owners, lawyers, war vets and a New York Supreme Court judge. The people of Mola di Bari have done much to make Carroll Gardens a very special place. I am one of the “uneducated” members of the Molese community in America. I was appalled by the article written by Miss Lisa Collins on July 10th, 2011. First of all, it was very poorly written. Secondly, it was full of misinformation. 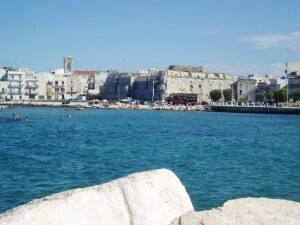 To begin with, Mola di Bari is not a fishing village, but a town with almost 30,000 inhabitants. Almost 50% of its people are sailors, manning luxury cruise ships, tankers, and merchant ships, transporting goods all over the world. 40% are owners of farms, cultivating their land for olives, grapes (considered to be the best in the world), tomatoes, etc., etc. This combination of hard working people make the town of Mola di Bari one of the richest towns in the Apulia Region. Testimony of this is the value of the real estate in Mola compared to the surrounding communities. Mola di Bari is sitting at the hill of the Italian Peninsula, the blue water of the Adriatic Sea, and the fishing done by the local fishermen makes Mola a very well known town in Italy. I am aware of the conflict between the Congrega and the so called Figli. No one was thrown out of the Congrega, they left on their own because their leader is a power hungry lady. Why else would she go through 3 vice presidents in a short period of time, who all quit in disgust. The Executive Board of the Congrega has remained intact ever since it was installed and re-elected by the membership. How long Mrs. Marinelli will last, nobody knows. Speaking of Mrs. Marinelli, I was told that she was banned from participating at the Congrega’s procession because she lied by not mentioning to the Congrega in a meeting that she was about to be a Grand Marshall at the parade of the splinter group. On a visit to the club of the Congrega, I was pleased to read the roster of the members, which is well over 200, and all of them PROUD MOLESI, and make no mistake, our women are not just good for one thing, they are our equals!!!! As a “feminist” and the daughter of a member of the Congrega, I am offended by the implications of this article. To suggest that the male members of the Congrega are chauvinistic, controlling and male-promoting, ignores and undermines their achievements. Similarly, to paint the female members of the group as submissive is equally degrading. The Congrega is a vibrant group of men and women that meets regularly for prayer, organizes fundraisers, concerts, and dinner dances, and works tirelessly to promote the traditions of its past and of the town they so adore. While no longer waking to its sunrises, swimming in its waters, or enjoying its fresh fruits, the Molesi-Americans are able to come together at least twice a year to reminisce as well as to enjoy who they have become and what they have accomplished here in the US. As a beneficiary of their work, I find it shameful that someone’s quest for power has caused a rift in what was generally a harmonious society. Further, reading how the Madonna is being used as a shield, when in reality she is being used as a sword, is laughable. Portraying the rift as a simple result of male v. female struggle misses the point. But, then again, I’m one of those feminist Catholics who, despite her father’s beliefs that she too can be president of the United States, is perfectly content knowing that only her male peers can ever become priests. Although, I appreciate the article and hope that the nonsense between the two associations is put to rest once and for all, I am also disappointed of the inaccuracies stated about Mola di Bari and its people. Mola is a large town by all standards, boasting close to 30,000 people in its last census. It is a rich town having been blessed with its proximity to the sea and with so many of its citizens residing all over Europe and in America whom over the years provided to its economy and development, making Mola one of the most desirable and rich towns in its Province. All one has to do is look at the value of real estate in Mola, it commands some of the highest prices in the Proince. In addition, the Molesi have been one of the most educated people in the Province, even the early immigrants could read and write, unlike many of the immigrants that came to the US from other parts of Italy. I would hope that in future articles the facts are confirmed prior to print time. Mola is certainly a well to do town with rich history and pride. Again, thanks for the article which has highlighted the issues of the Associazioni, however, as a Molese I feel obligated to address critical points of its content. america. Mola is not a fishing village it is a town with 30,000 people. It has a piazza with a large fountain which every Sunday and week nights is filled with people. It has many restaurants and pizza parlors. The town is filled with tourists from all over Europe. Did anyone fact check the article? Who conducted research? This article is poorly written and contains many inconsistencies. Well, Mola is a city of 30,000 inhabitants, not 2,500. Mola’s patron saint is Maria SS Addolorata, not “Idolorata”. Did anyone fact check the article? Who conducted research. This article is poorly written and contains many inconsistancies. I love this story, Lisa. Just brilliant.